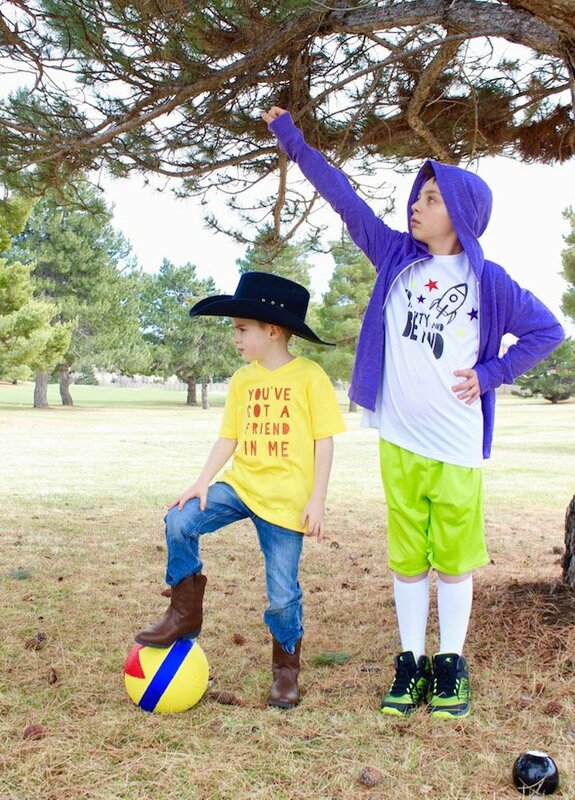 Just last weekend, at exactly 9 a.m. my boys said those two dreaded words: “I’m bored.” At first, I thought about the baskets full of toys in their room, and I got mad for how ungrateful they were. In that moment, I swore I would never buy another toy again. Quickly, I got my wits about me, and I thought about my approach, which as we parents know, approach is the key to winning parenting battles. I chose to remind them about the lessons learned from one of their favorite animated movie experiences of all time, the beloved Disney Pixar Toy Story film series. I reminded them about how sad their forgotten, dusty toys were, and how badly they wanted to be played with. 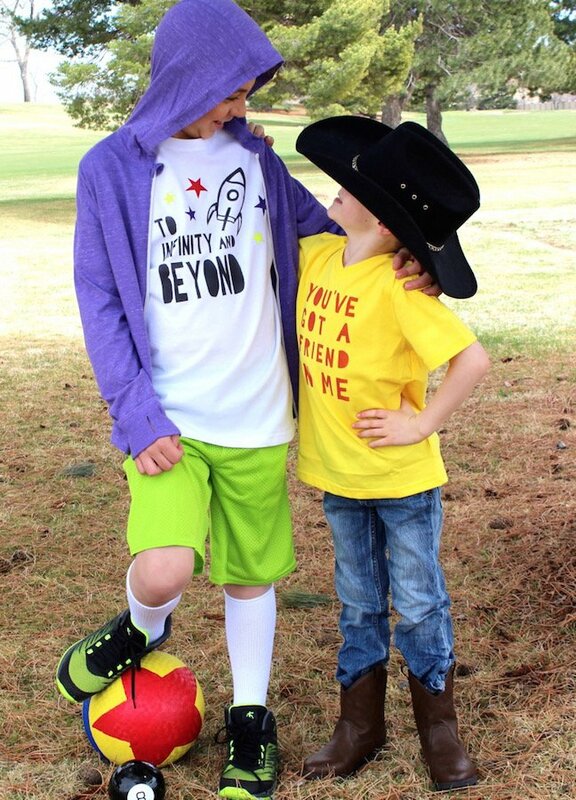 Not only did Woody and Buzz Lightyear (and the rest of the lovable crew) teach us about friendship, teamwork, and growing up, they showed us that toys don’t belong on a shelf or in a box—they belong with children who love them and create an imaginary world with them. Speaking of Disney bounding, my family is literally Disney bound this spring. It’s our first trip to Walt Disney World Resort, and my kids can’t contain their excitement. 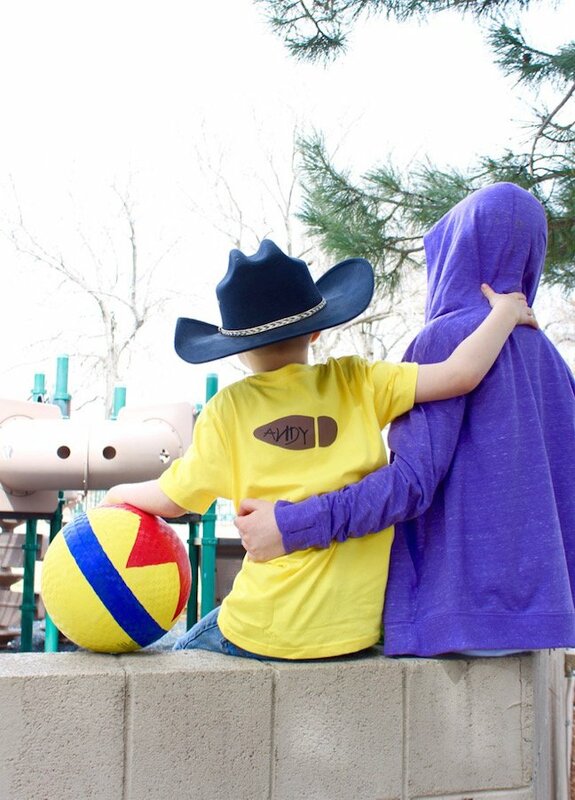 They are super bummed to miss out on Toy Story Land, which opens on June 30th at Disney’s Hollywood Studios, but that just means another trip is in our future. Between the exciting Slinky Dog Dash roller coaster and fun Alien Swirling Saucers ride, one can only imagine the amazing memories and adventures that Toy Story Land has in store for so many families. Though it’s not yet open during our visit, my boys are going to wear their new DIY Toy Story t-shirts at Magic Kingdom Park. 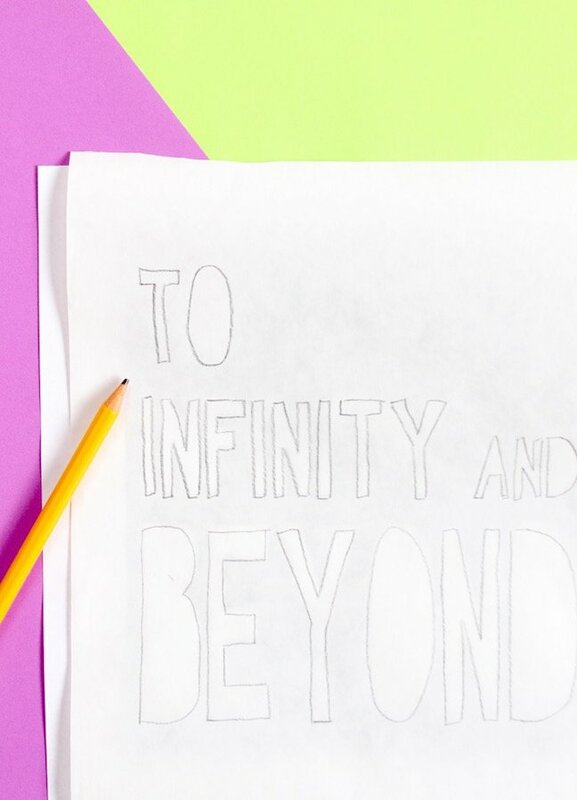 Step 1: Find or create the words you want online, and print. To change the size, adjust in Microsoft Word. 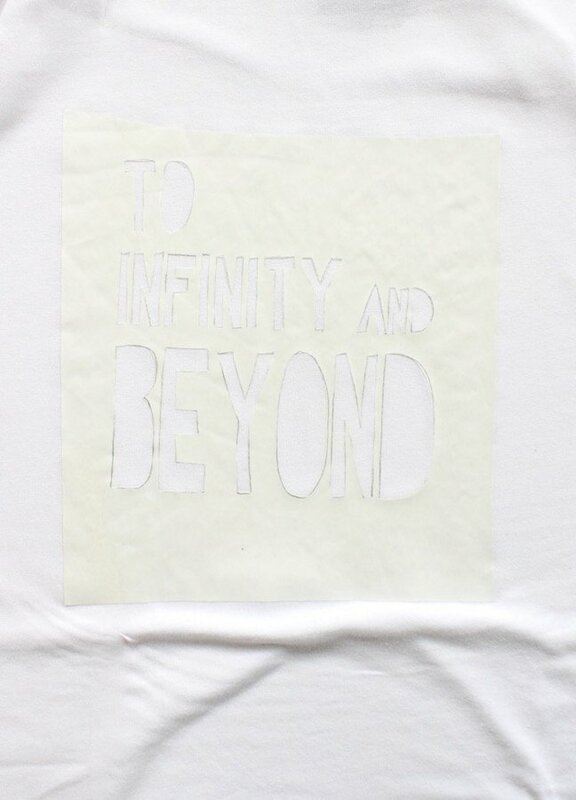 Step 2: Cut a piece of freezer paper the size of the printable, and begin the trace all the letters or design. 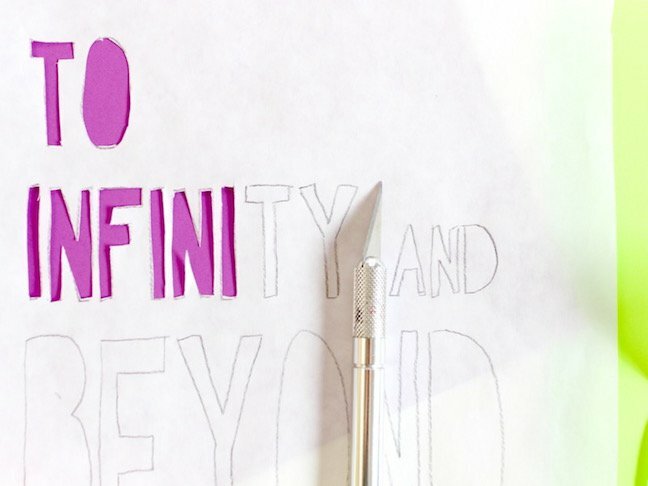 Step 3: With an X-acto knife, cut around all the letters. Step 4: Set the iron on cotton setting, and make sure the steam setting is off. 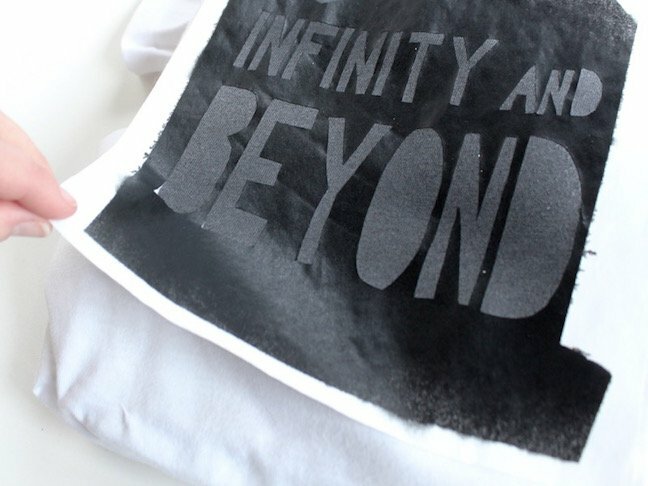 Place the design where you want it on the shirt, wax-side down, and then press down with the iron on the freezer paper. 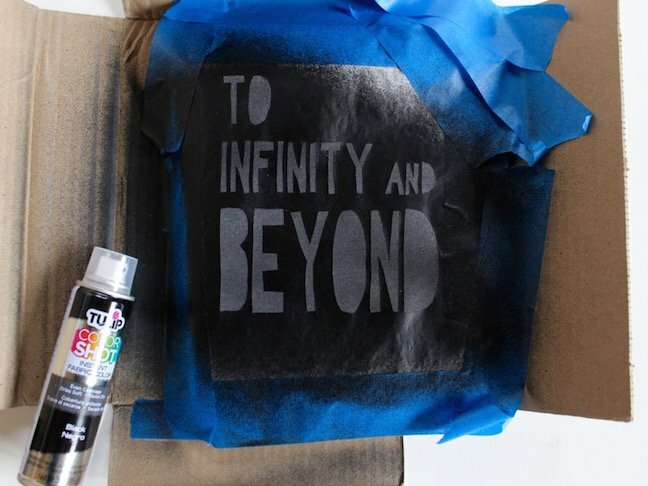 It will immediately “stick” to the shirt, creating a DIY stencil. 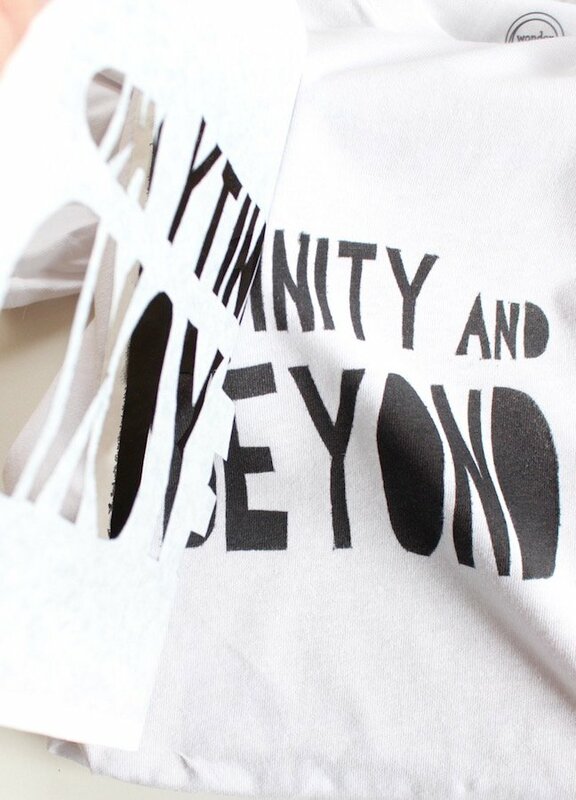 Make sure all the edges of the letters are ironed on. 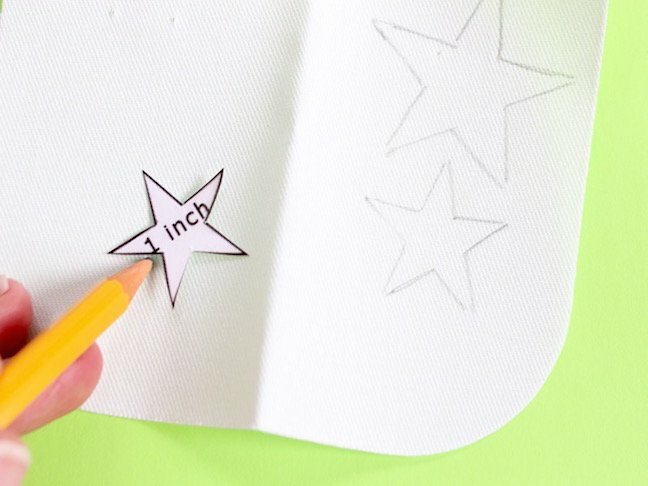 Step 5: Once the design is ironed on, gently place a piece of cardboard under the shirt (you can do this before ironing the design on the shirt, too). Now it’s time for the painter’s tape and cardboard box to come into play. 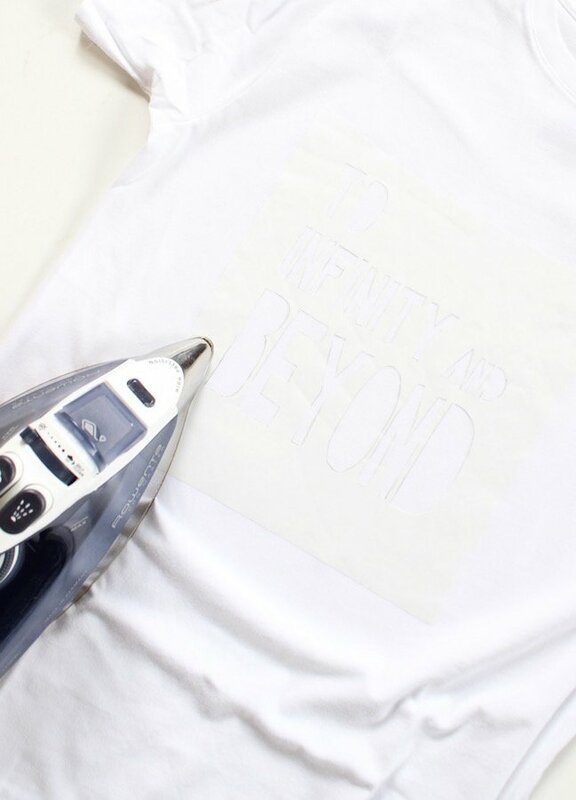 Use painter’s tape to wrap all the edges of the shirt, so no part of the cotton is visible. This is to protect the rest of the shirt from spray paint. 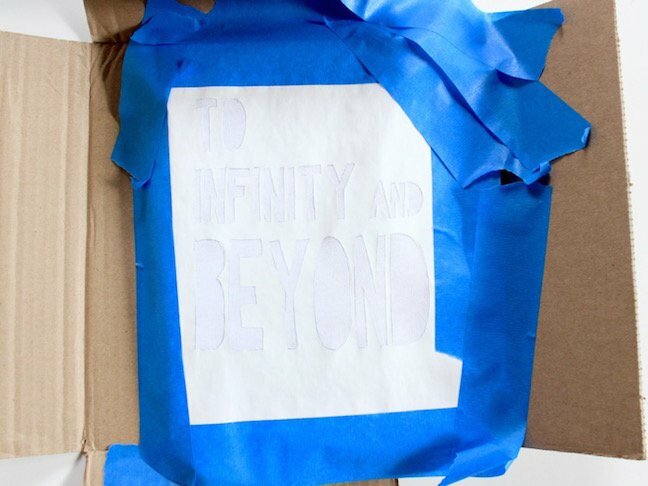 Set the shirt inside the cardboard box, and follow the Tulip Color Shot Fabric Spray Paint directions. I found it best to spray directly above the design, not angling the can too much. I was a bit nervous to use spray paint, and I debated whether or not I should dab the paint with a paintbrush. However, in the end I was so glad I went the spray paint route because it was fast, and the paint doesn’t dry hard. It’s the first time I used fabric spray paint, and it worked on the first try! I used just one coat of paint. Step 6: Wait 20 to 30 minutes to remove the paper from the shirt. 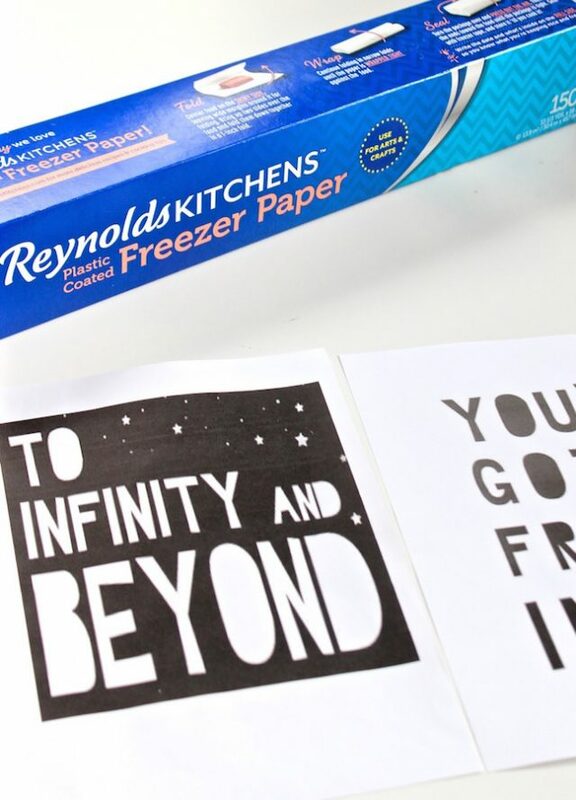 Once you remove the tape, pull the freezer paper up to reveal the design. Continue to let the shirt dry. 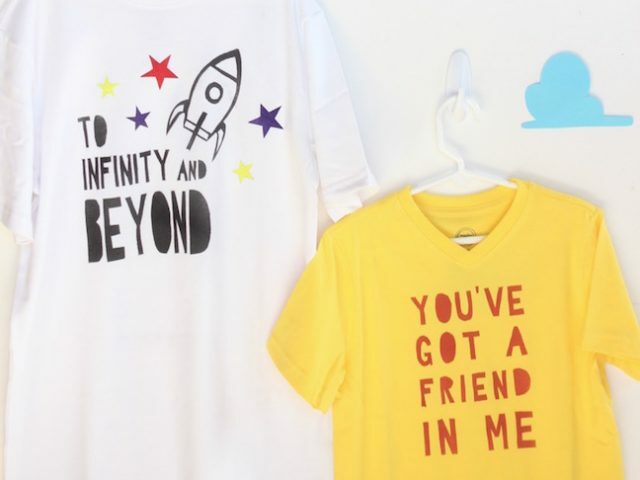 Once I did the words on the Buzz shirt, I felt it was missing something, so I followed the same steps to make a little rocket ship. 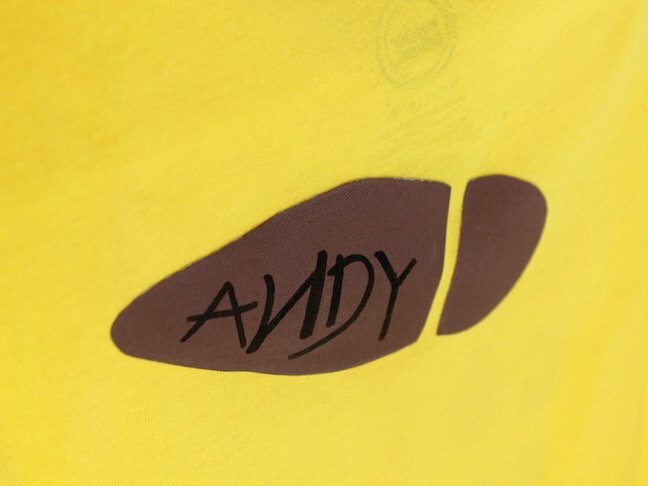 You will do the exact same steps for Woody’s shirt, as well. 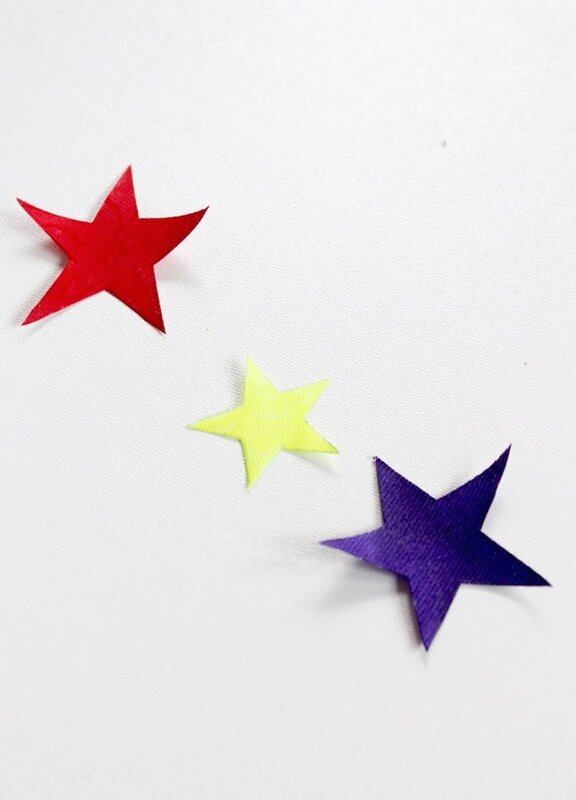 Step 7: For extra embellishments, such as colorful Buzz-inspired stars and Woody’s boot print, I used iron-on patches. 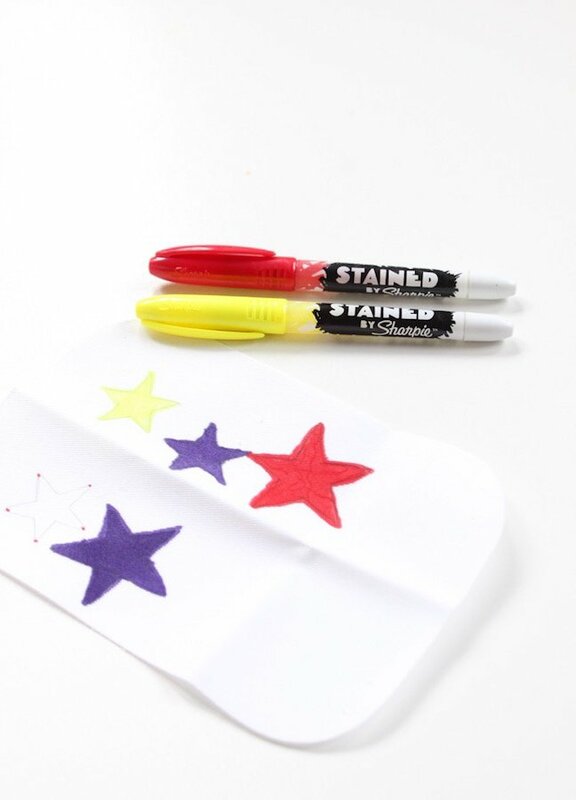 To create these, trace any design onto the patch, and then color with fabric markers. 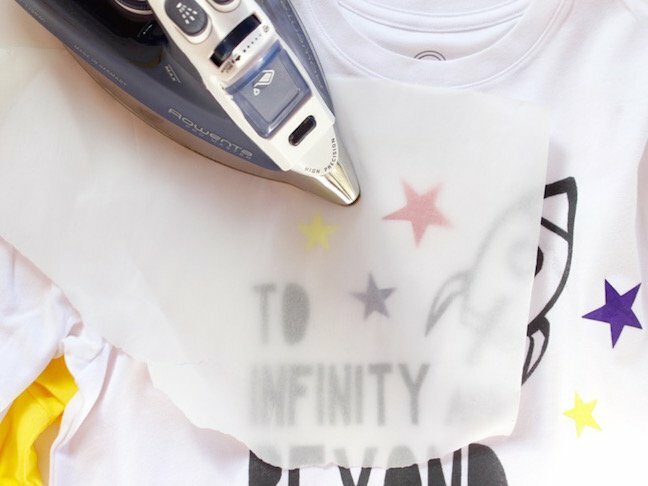 Next, cut the designs, and use package directions to iron them onto the shirt. Remember to use parchment paper in between the stars and boot, and the iron. This will prevent paint from “coloring” the iron, thus “coloring” your shirt with color in places you don’t want. Step 8: To complete your Disney bounding outfits, find accessories around the house that are the same color scheme as Woody and Buzz. For example, jeans, cowboy boots, and a cowboy hat work great for Woody. 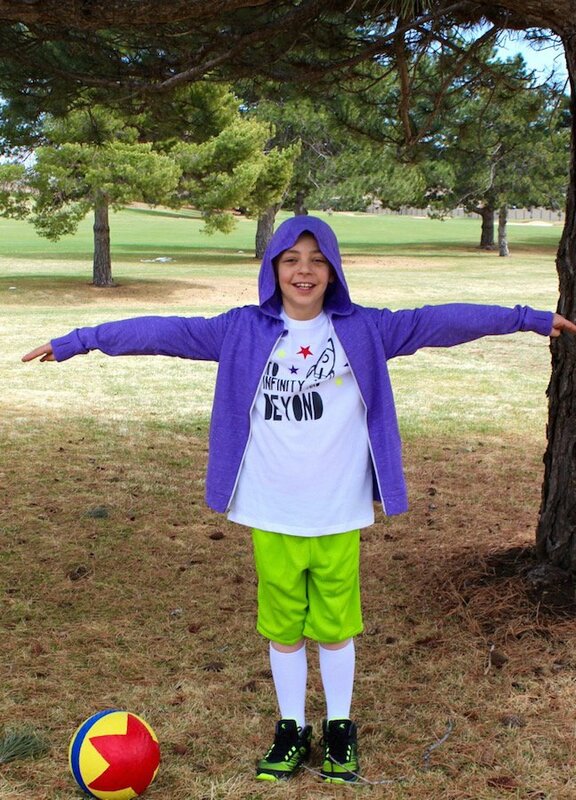 For Buzz, my son wore bright green shorts, a purple hoodie (similar to the purple hood Buzz wears under his space helmet), and high-top shoes with lime green on them. Now all your kids have to do is play! 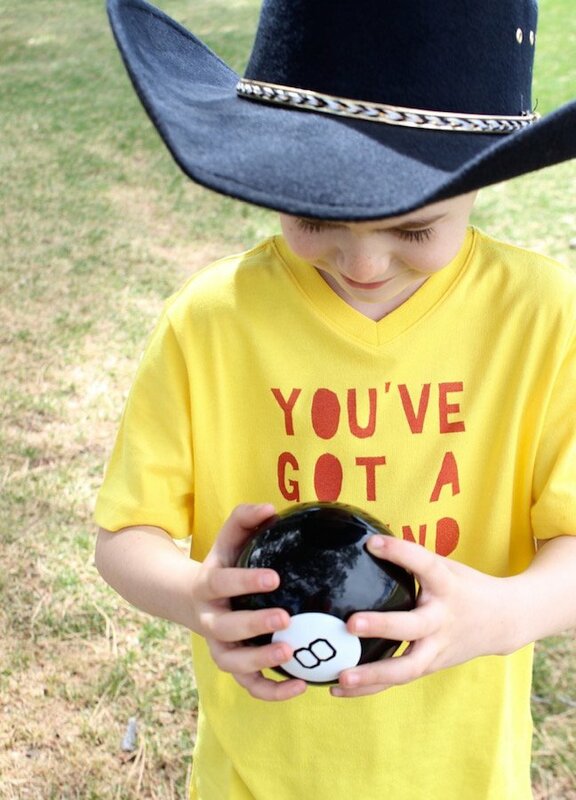 We painted a yellow ball to look like the Toy Story ball with a bright red star on it. It made my heart swell to see my kids playing so happily with their toys. There was no screen, just pure imaginary play. These two are brothers forever. 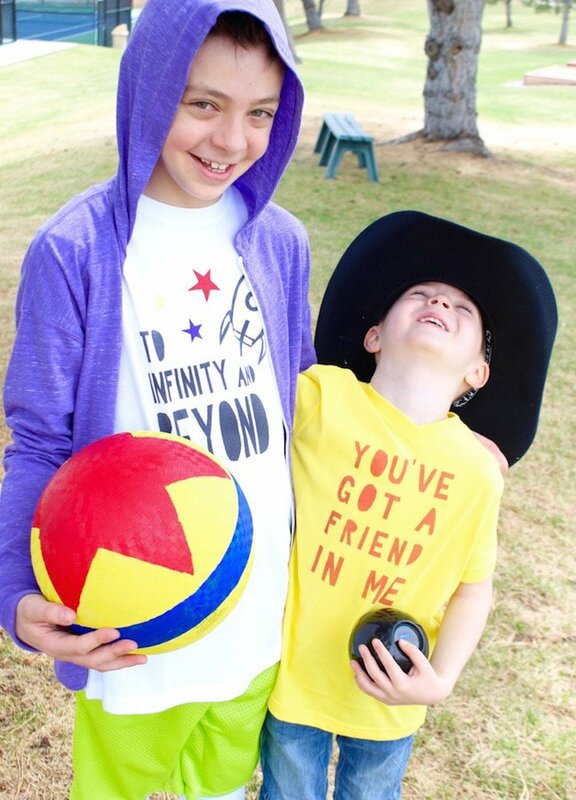 Yes, they will fight, love, play and grow up (cue the tears), but one thing’s for sure, they have a friend in each other, and they’ll continue making memories together, whether at home or on an adventure at Walt Disney World Resort, and I am forever grateful for that! 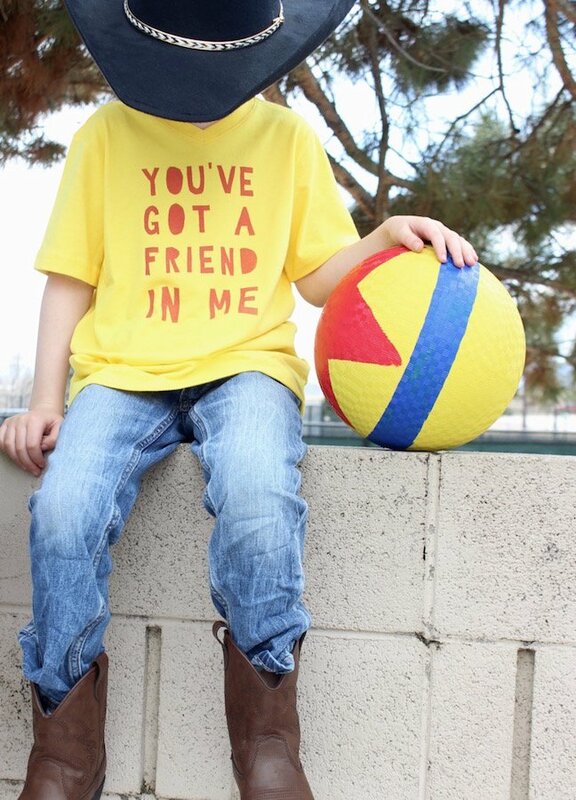 After all, that’s what the line, “You’ve Got a Friend In Me” is all about.